Is that not an amazing commercial? Say what you will about their coffee (you may or may not be a fan), but Tim Horton’s knocked it out of the park with this creative genius. Sure…there are 100’s of other drinks or food choices one could use to bring people together, but the point was well made. And how timely is this commercial? You could show this in any season. But this past week, with all the talk about borders and the lack of human dignity, we needed to be reminded just how important it is to break down walls and both love & see our neighbour as our selves. 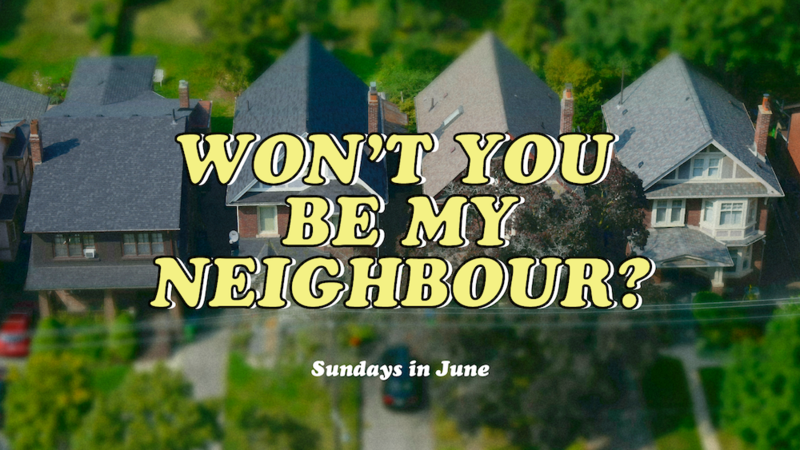 We’ve been asking this question the last few weeks…won’t you be my neighbour? And challenged ourselves with this other question…what kind of neighbour will you be? You know what’s at the heart of this conversation? Why neighbouring is difficult? Because human beings are diverse and complex beings. So here’s a third question? How can I connect with those who are different then me? How can I be a neighbour to someone who looks, talks, acts, lives, and believes differently than me? You know this to be true simply because even the people who are closest to you are different than you…in character, personality, interests, etc. You also know this to be true because we all share similar needs, food, rest, relationships, shelter, etc. If we’re all the same, but also all very different, why is it that we have such a hard time relating to people who are both the same and different if every one is both the same and different? A bit of a tongue twister, but worth asking. Let me got this out of the way: we should appreciate people’s differences! People who follow Jesus should appreciate people’s differences! Because Everyone Matters to God. Period. We’ve been coming back to the same story, week after week. It’s found in two gospels, Mark 12 & Luke 10. In Mark Jesus is asked what is the greatest commandment. In Luke he is asked how one experiences eternal life. The response is the same: Love God & Love Others. Love God…how…with all your heart, soul, mind and strength. Love your neighbour…how…as you love yourself. Know that this question is more about ‘who is pure?’, ‘who is to be loved?’. Up to this point, they’re pretty sure neighbour would be someone close to them, like them, in their clan or tribe or culture or religion. If you were here in week one (or read our recap), we learned that Jesus is quoting Leviticus, a book for Israel, to help Israel live in community. So the initial reference is about someone who was close, in culture and experience. Jesus…as he does so well…expands our understanding of neighbour…and by doing that also expands our understanding of love. I love that Jesus doesn’t just say, ‘correct answer’, he says, ‘go and live this out’. This isn’t just about who has more compassion, it’s about who the Samaritan is in the story? Samaritan’s and Jews didn’t get along. Samaritan’s were different. They weren’t ‘pure’. They were ‘other people’. YET…the Samaritan is the neighbour in the story who loves on the other (needy) neighbour in the story. Jesus identifies the neighbour in need, and the neighbour with love. The original listener, a religious Jew, thinks the priest or the Levite is correct? (stay clean…they’re not one of you…they’re not your neighbour…they’re not the same culture) But…by obeying the Torah (Law), they disobeyed it’s intent (Loving others). Remember this: Loving others beats loving the Law. Love people more than you love your Bible. Why? Cause if you love your bible more than you love people, you’re probably not falling in love with the Jesus we find in the Bible. Neighbouring is so important because the way we treat others is a reflection of our relationship with Jesus. The difference is, you’re not sifting through your options, but looking to live out Jesus’ love of others. That sounds extravagant, I know, but it’s the kind of love God has for us…and the kind of love that should pour out of us for others. – Instead of walking to the other side of the street to get away…walk to the side they’re on to get to know them. 3) Build a relationship with someone who is different. Examples would be…people who don’t have your sexual orientation, who is of a different faith, who is of a different class or financial bracket, who sees the world differently than you do. – If you look into each of those persons eyes, they matter to God! – This is not to say that you should stay in a toxic relationship…or allow others to bully you or abuse you…not at all! 4) Pray…for those you love and for those you have a hard time loving.